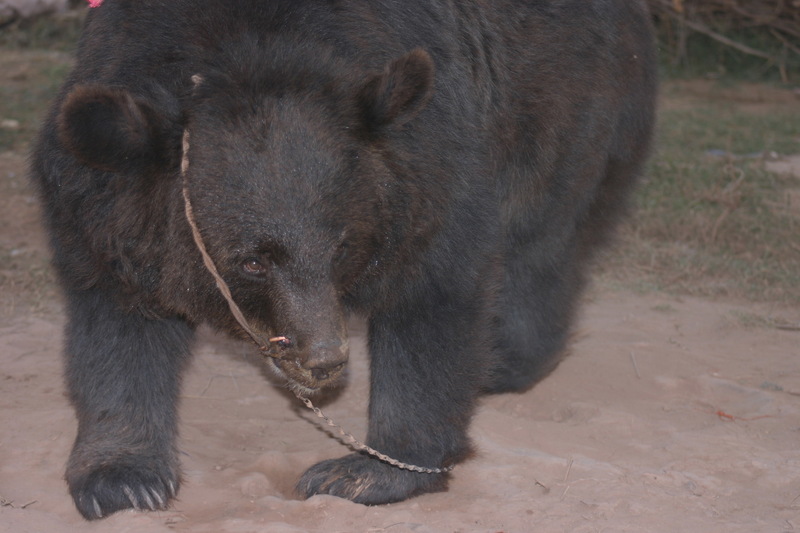 On the morning of May 7, 2014, at around 3 am, a large-scale bear-baiting event was planned in Pind Dadan Khan, District Jhelum by powerful landlords, Faisal, Sarfraz, and Ataa Bhatti. The event had all the hallmarks of an illegal activity: surreptitiously-planned, organized well in advance and held in a secret location with most of their followers and friends invited to participate. The organisers and participants believed they would not be caught and arrested by choosing a secret location. The location chosen illustrates the lengths to which organisers will go to avoid detection – it was held on an island on the River Jehlum – a delta bordering the boundaries of three districts Jehlum, Khushab and Sargodha. The border location seems to have been intentionally selected to create confusion amongst authorities about ultimate jurisdiction for enforcement action. The tehsil was Pind Dadan Khan, district Jhelum. BRC reported a possible event to wildlife authorities and this turned out to be correct. The wildlife authorities acted promptly on this information by eliciting the support of relevant law enforcement authorities. The police force, under the direction of District Police Officer Jhelum, and wildlife staff, headed by three district wildlife officers from Sargodha, and Khushab, approached the secret location and raided the event. In total, 46 people were involved in the event.The event was organized with generators for a light system and a movie camera for coverage of the event. 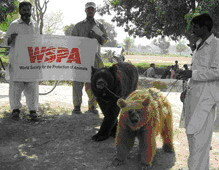 Six bears and several dogs had been brought to the event. Two bears had already been baited by the time authorities arrived. Three people and three bears managed to escape. The vehicles and all their belongings were taken into custody. The case is now progressing through the courts. The bears that were confiscated and the people who were arrested were brought before a civil court, Pind Dadan Khan, and the case was presented in front of a Civil Judge. The case was filed by the wildlife officer Jhelm Sajjid Latif and registered under the Punjab Wildlife (Protection, Preservation, Conservation & Management) Act 1974 (Act No II); section 6-C of the Prevention of Cruelty to Animals Act 1890 (No XI), and the Punjab Prevention of Gambling Act 1977 (No XXVIII). The case was registered with the Police Station Lilla. The four confiscated bears were then ordered by the Judge to be handed over to District Wildlife Officer Jhelum who transferred them to the Bear Sanctuary at Balkasar Chakwal. The rest of those arrested were released on bail. In the second hearing of the case, May 12, the defendants requested the bears to be returned, but this request was rejected. No judgment has been issued by the court as the case is still ongoing. Two bears, owned by Abdul Aziz/Farooz Bhatti, managed to escape from the scene. After about 18 hours of searching/chasing in district Sargodha,district wildlife officer Sargodha captured the bears and carried them to Tehsil Shahpur. The civil court refused to take up the case so Farooq went to the session court Shahpur and explained the fact of the case, advocating strongly for the case to be heard. The Sessions Court then issued orders to hear the case. On the basis of these orders, the civil judge formally heard the case but ended up releasing the bear and its owner for unknown reasons. The bears arrived at Balkasar Sanctuary Chakwalon the evening of May 8, and were kept in temporary cages. They were offered milk and water and then later next day they were released into the quarantine enclosures. Their arrival protocol has not been completed – nose rings regrettably cannot be removed until the court issues a final order.